OK the title of this post is a peculiar one, I mean imagine if you could actually buy hairy staples for your stapler? OK moving on...rather quickly! 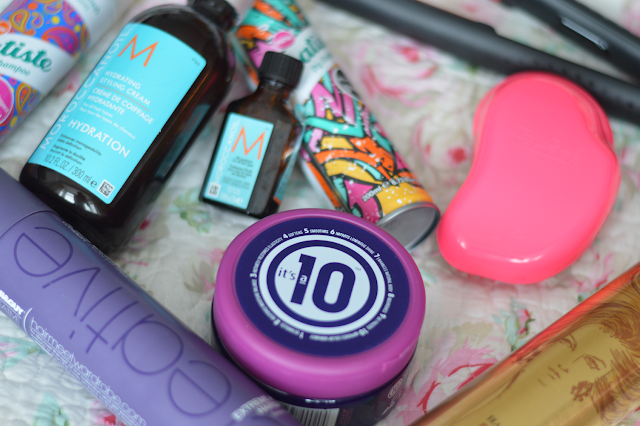 I wanted to blog about my haircare staples, some have only just made it into this post but nonetheless they are still worthy and very much loved despite only being in my life a short time. As some of you may already know I had a fringe cut in last week and it's been a week all about hair. My god did I take not having a fringe for granted, I mean how do people manage going out in the British weather with a fringe? I mean that's an incentive in itself NOT to get one cut. You have to face the wind and rain on a daily basis, luckily for me I am use to the weather but not a fringe it would seem. Luckily for my fringe and my ego I have a good supply of hair products to help me fight the great outdoors! OK first thing is first I just want to say that Batiste has been my right hand man this past week, I have reached for this daily and it's been a total life saver for me! I have been using Batiste for a couple years now and whilst I'm not a fan of every can I am a fan of New Graffiti exclusive to Boots, the can alone is winner. The other batiste dry shampoo is Paisley and this is exclusive to Superdrug, to be honest they're both as good as one another. So it comes down to the scent and look of the can, Paisley is fruity & floral whereas graffiti is more fruity & woody. I love the big sized cans, they last an age and the small purse sized cans are fab to have stashed away in your handbag. As for tools I have been relying heavily on my ghds I have the red plated limited edition Katy Perry Scarlet straighteners. I've used them daily since my new do, they heat up very quickly and do the job in a matter on minutes. Great for busy mummies, plus the travel ghd hairdryer is also a staple. It may be small but boy does it pack a punch. I have a lot of hair which takes an age to dry but with the help of the travel hairdryer my hair dries in no time. My hair isn't use to having heated tools on it daily so I've had to make sure I treat it well and replace any moisture. I don't want it to get dry or damaged, I've been testing It's a 10 Miracle Hair Mask. I have tried a couple products from the It's a 10 range and loved them both especially the Leave-In Treatment. I recently mentioned this in my Weekend Wonders #1 post. The Miracle hair Mask smells good enough to eat, you just want to scoop up the product and lick it. I wouldn't suggest this though, It's probably better suited to your hair. It helps detangle hair, restores moisture and much more. 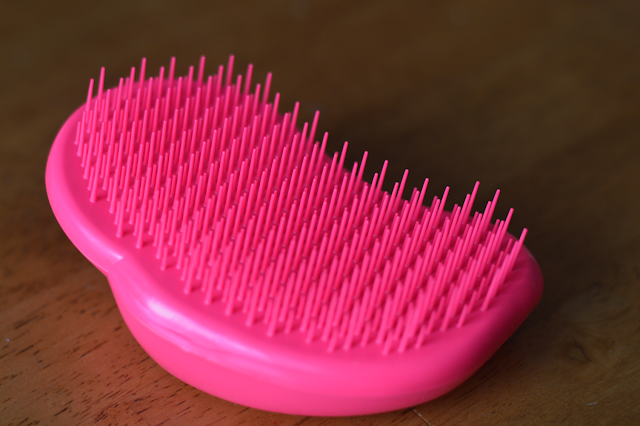 The newest hair staple which is a must for me now is the Tangle Teezer. It's one of those products which once you've tried it you wonder how on earth you coped without it? A must for long locks. very easy to hold and control, I opted for the Bubblegum Pink colour. It was a no brainer really. I find separating my hair into two sections makes the task a lot easier. I tend to brush through my ends first to rid them of any nasty knots and then gently work may way up the hair brush out the tangles gently. Ending with a nice brush through the whole of my hair. Before the Tangle Teezer came into my life I was using the Tangle-Tamer by Denman, I still use this and still rate it. I also use this on my little girls hair on her tangles and it helps but having said that I think the Tangle Teezer works better on her hair. I will continue to use them both and will keep you updated with my findings! The last two products I want to mention is the Moroccanoil Styling Cream and Treatment Oil, both of these work well together but the one I want to give a big shout out is the Styling Cream. It leaves my hair looking healthy, glossy and healthy. It has the Moroccanoil scent which smells so good, I'm sure you'll all agree if you've smelt the range. 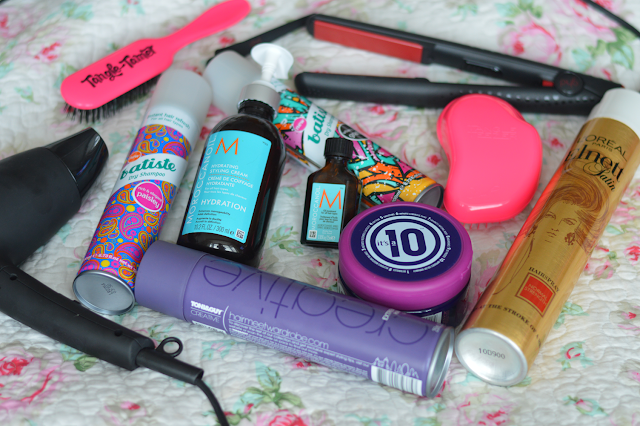 I use 1-2 pumps of the styling cream when my hair is almost dry. I rub my palms together to help distribute the product evenly on both hands and then work the product into the ends and through the mid-end sections. I let the product work it's magic for 5 mins and then usually leave my hair to naturally dry or if I need to pop out I will then finish styling my hair either with the irons or the hair dryer. So there's my hairy staples! Hope you enjoyed it! I've heard good things about the products in the 'Its a 10' range! I never know where to get it from though! Im loyal to my tangle tamer over a tangle teezer. I just prefer it! The It's a 10 range smells sooooo good! I have soooo been missing out! So glad I have one now, my long hair loves it! I find the Tangle Teaser works better when my hair is either wet or damp, have you tried it with damp hair or dry?